Following an outstanding career at Syracuse, in which he distinguished himself as an all-around athlete (lacrosse, basketball, track & field) as well as in football, Brown was chosen in the first round of the 1957 NFL draft by the Browns. With his blend of speed, power, and agility, he moved quickly into the starting lineup as a rookie, leading the league in rushing with 942 yards that included a single-game record at the time of 237 yards. He received MVP as well as Rookie of the Year honors, was a consensus first-team All-Pro and was selected to the Pro Bowl. In 1958, Brown set a new single-season rushing record with 1527 yards, again receiving MVP honors, and continued to lead the NFL in rushing in 1959, ’60, and ’61. He was a consensus first-team All-NFL selection as well as Pro Bowl selection following all of those seasons. In 1962 Brown dropped to 996 rushing yards and, while he again received Pro Bowl honors, received only second-team All-NFL recognition from UPI. In a down season for the Browns, he achieved career highs in pass receptions (47) and receiving yards (517). Browns went 10-4 to finish second in the Eastern Conference while leading the NFL in rushing (2639 yards). Having broken his own single-season rushing record in 1963, Brown was again the NFL’s leading rusher in 1964 and ’65, his last two seasons, giving him eight titles in nine years. Along the way he set numerous records as well as a new standard for running backs to be measured against. He retired as the all-time leader in rushing (12,312 yards) and touchdowns (126). Brown averaged 5.2 yards per carry and 104.3 yards per game over the course of his career. He was selected to the Pro Bowl in all nine seasons, was a first-team All-Pro eight times, and received MVP recognition on four occasions. 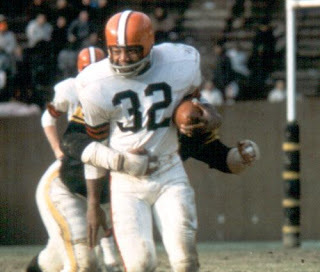 Brown’s #32 was retired by the Browns and he was inducted into the Pro Football Hall of Fame, Class of 1971.